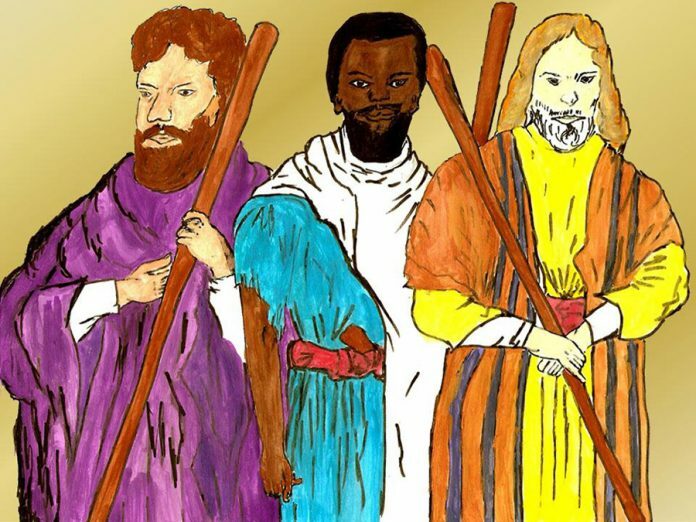 ACCORDING to the Bible, Noah had three sons, Shem, Ham and Japheth. Eurocentrists have illogically tried to portray these children as people of varying races in a bid to promote racial superiority on their part. Because Shem has a birthright, heritage and descendants like the Israelites who have an ordained priesthood to God, whites have tried to portray themselves and other none-black groups as Shemites. Also because a curse was cast upon one of Ham’s children by Noah, whites have tried to portray blacks as Hamites that are to use their superior physique and plenteous resources to serve whites and other non-black groups. Sadly, this sophistry has been misconstrued as truth by many. In reality, Shem, Ham and Japheth were of one race in the way siblings ought to be. If common sense does not tell that the founders of the human race were blacks, then science, anthropology and genetics do. There were no whites or any other race but blacks in the genesis of mankind and for thousands of years after that. Thus, it is important to forget the false images of Shemites as whites in order for this article to be understood objectively. On that note, the Hebrew people mentioned here are the blacks who actually lived in the region between Africa and the Mediterranean (Eden), not the whites who call themselves Jews today and are incapable of relating to the similarities that will be pointed out in this article between Shemitic and Bantu or southern Hamitic languages. The Hebrew spoken about here is biblical Hebrew and not modern Hebrew which is actually Yiddish and incorporates a lot of German and other European words, pronunciation and grammar which was unknown to the biblical Hebrews. ‘Ish’ is ancient Hebrew for ‘prince’. The ancient meaning is almost identical to the Shona word ‘ishe’ which stands for ‘lord’. In contemporary Hebrew, ‘ish’ is the word for ‘man’ and ‘isha’ for ‘woman’ and their origins are from the ancient word ‘royalty’. The name ‘Israel’ (Ish-ra-el) which was given to Jacob, a key Hebrew patriarch, literally means prince of/to God. It is clear to any Shona speaker that even the word ‘ra’ in ancient Hebrew which meant ‘to’ or ‘of’ is identical in form and use to the word ‘ra’ in Shona. ‘Ra’ indicates the possessor just as ‘wa’, ‘cha’ and ‘ya’ in Shona. In contemporary Hebrew, ‘ra’ is now pronounced as ‘la’ but retaining the same meaning. The interchangeability of ‘r’ and ‘l’ is a common Bantu language feat which can be found among languages like Shona, Ndebele and Chewa. In Chewa, the name ‘lamulungu’ means ‘belonging to God’ and is given to the Sabbath day. In the Remba tongue, this name is pronounced as ‘Rahmulungu’. This interchange can also be found in the names ‘mulungu’ and ‘murungu’ which both mean ‘lord’ and not ‘whiteman’ as many now wrongly assume. The word predated the coming of whites and prior to their arrival, ‘murungu’ was used to refer to black groups such as the Remba. This was because of their priesthood, skills and craftsmanship which contributed to a southern African renaissance after they entered the land from Sena in southern Arabia. This was during the Moorish period between 700 CE and 1300 CE. The whites were called ‘varungu’ because after their settling in the land, our criterion and style of civilisation became Western-oriented. Whites were therefore called ‘lords’ because they were the new trendsetters and their religion, clothing, education and so on would overtake that of the indigenous people and challenge traditional systems. Another word which has completely Shemitic roots is ‘Mwari’, ‘Nwali’ or ‘Mwali’. This word means God, but not in the sense of a god which can even be attributed to a mere object. It means the God and has a strong monotheistic appeal. In Hebrew, the word for god is ‘el’ and ‘eli’ means ‘my God’. In Arabic, which is a close relative to Hebrew and is likewise Shemitic, the word for god is ‘ilaah’. To stress that the God in question was the Creator and not an idolised object, the descendants of Ishmael, son of Abraham and uncle of Jacob Israel combined the words ‘al’ meaning ‘the’, and ‘ilaah’ meaning god, to give us the name ‘Allah’ meaning ‘The (One) God’. It is this same process that took place in southern Africa to give us the name ‘Mwari’, which is attributed only to the Creator and enjoys the same monotheistic appeal as ‘Allah’. The ‘mw’ is therefore equivalent to ‘al’ (the) and ‘ari’ to ‘el’ or ‘ilaah’ (god) in Arabic and Hebrew, meaning ‘the one who is or living God’ in Shona. ‘Layla’ means night time in Hebrew. It is similar to ‘rara’ or ‘lala’ which means ‘sleep’ in Shona and Ndebele respectively. Similarly, ‘boker’ means ‘morning’ and is similar to ‘muka’ or ‘vhuka’ which means wake up in the above named Bantu languages. These similarities can be used by Bantu language group speakers as pneumatic devices to effectively learn Hebrew. The phrase ‘let there be’, as in ‘let there be light’ is spoken as ‘ihi’ in Hebrew. This is identical to the chiKaranga ‘ihi’ or chiZezuru ‘inzi’ which translates to ‘let it be called’. The Hebrew word for ‘me’ or ‘I’ is ‘ani’. This is almost identical to ‘ini’ which means ‘me’ or ‘I’ in Shona. ‘Ani’ also exists in Shona, meaning ‘who’. The Hebrew name for darkness is ‘husik’ which is similar to the Shona word for nighttime, ‘husiku’. In the house of Israel, the name ‘Jacob’ was derived from ‘ya-kuba’ which literally means hand (ya) on heel (kub). Jacob had an older twin, Esau who he came out of the womb after and was firmly gripping his elder’s heel. After Jacob won over Esau’s birthright and blessing, the word ‘yakuba’ was used by Israelites to mean ‘steal’ or ‘supplant’. In Shona, the word for ‘steal’ is ‘kuba’ and this is a very interesting linguistic and cultural connection. The Hebrew name for mankind is ‘Adam’. The word ‘adam’ means humans to this day and was derived from the Hebrew word for soil, adama. The word ‘dema’ which is Shona for ‘dark’ and is used to describe the complexion of blacks. ‘Dema’ may very well have been derived from ‘adama’, the Hebrew word for ‘soil’. Besides a black/brown colour that is assumed when water touches the earth to form mud, the soil also has a reddish colour. From this same word, ‘adama’, the Hebrew people derived the word ‘edom’ which means ‘red’. Thus, it is not farfetched at all to think that the word ‘dema’ (dark/black) has like origins. Besides this, there is also the ‘son of man’ and ‘son of God’ concept that is shared among the Hebrew and Bantu people. As mentioned earlier, the word ‘Adam’ is equivalent to the word Bantu (vanhu). In ancient Hebrew philosophy, only righteous people with humaneness were considered children of Adam (mankind) or God. This is similar to the ‘Munhu munhu nehunhu’ (One is considered human through humaneness) concept which made way for such phrases as ‘mwana wevanhu’ (son of man) or ‘mwana waMwari’ (son of God). Even among the Hebrew Israelites, only the descendants of Abraham, who followed his covenants, were considered his children. Previous articleWhat is required to achieve middle-income status by 2030?